Designation: Department of Pediatric, Alt?nbas Un?versity Medical Faculty, Alt?nbas Un?versity Medical Park Bahcelievler Hospital. List of Author(s): Solgun HA, Yurdaisik I. Copyright: © 2019 Solgun HA. This is an open-access article distributed under the terms of the Creative Commons Attribution License, which permits unrestricted use, distribution, and reproduction in any medium, provided the original author and source are credited. A 29 gestational week old premature newborn born via caesarian delivery in charged to newborn ıntensive care unit with prematurity and respiratory distress syndrome. In the physical examination of patient, elbow deformity and decreased movement in the elbow and shoulder were observed in the figure. Radiographs and subsequent ultrasound were used to make the diagnosis of distal humeral epiphyseal separation in the figure. The diagnosis was made at 120. hours after delivery. Closed reduction and immobilization with long arm posterior plaster splint on elbow 110-degree flexion were performed by orthopedic surgeon. After two weeks’ immobilization, plaster splint was removed. Postoperative follow-up with clinical and radiographic examination showed abundant bony healing and early restoration and functional recovery of left elbow and brachial plexus pseudoparalisis at the first month of follow up. Distal humerus epiphysial injury, Brachial plexus pseudoparalysis, Prematurity, Caesarian section delivery. 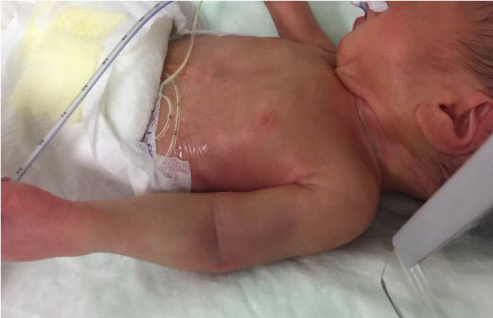 Distal humeral epiphyseal separation is a rare entity in newborns especially in prematurity. A few case reports have been published, and treatment nor diagnostic features are not defined well. Such fractures occur more often in emergency caesarian section or vaginal delivery. The differential diagnosis with elbow dislocation can be confusing. Diagnostic methods like radiography, arthrography, magnetic resonance and ultrasound or a combination of these have already been described to make diagnosis . Whether these lesions are conservative or surgical treatment, most of cases have a good prognosis. 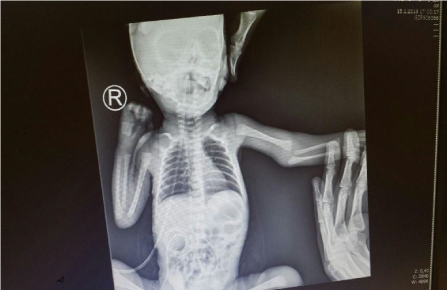 We present a case of distal humeral epiphyseal separation in a premature neonate which was managed conservatively at our neonatal intensive care unit with a good outcome without functional deformity. The female newborn of 29 gestational weeks was borne with caesarian section delivery at an another medical hospital and transported to our hospitals newborn intensive care unit for hospitalization via prematurity and respiratory distress syndrome. Pregnancy was controlled because of severe pre-eclampsia, but there is no other obstetric history was present. Delivery was an emergency caesarian section at 29 weeks for maternal problems. The baby needed continuous positive airway pressure in the delivery room. Apgar score was 6/8/9, and birth weight was 1180 grams. Examination showed swelling, deformity and tenderness around the left elbow, with a mechanical limitation at 90° of passive flexion (Figure 1). There was no Moro reflex on left upper extremity Radiograph revealed posteromedial displacement of the proximal radius and ulna with respect to the distal humerus (Figure 2) Normal relationship of the proximal radius and ulna was apparently maintained. There was no evidence of bone fractures in the distal metaphyseal region of the humerus or in the proximal radius and ulna (Figure 2). The patient was initially diagnosed clinically as having a dislocation of the elbow. But distal humeral epiphyseal separation was diagnosed via ultrasound (Figure 3). Because of extreme prematurity and low weight, it was decided not to attempt an open reduction. On day 5 after caesarian section delivery, closed reduction was attempted; this was successful. Consequently, a full cast in 110° of flexion of the elbow and pronation of the forearm was applied until the sonography revealed periosteal reaction and new callus formation over the distal humeral metaphysis at around 2 weeks. There are no neurological problems, before and after reduction maneuvers, were seen. At discharge (76 days of life), passive or active restriction of range of motion at the elbow wasn’t present. Four months after injury, new X-rays were done and observed good remodeling changes over the distal humeral metaphysis, which corresponded with the previous sonographic findings (Figure 2 and 3). The articular relationship was normal, for both flexo-extension of elbow and prono-supination of forearm were evaluated normal. General view of distal humeral epiphyseal seperation of right side of premeture patient. Figure 1: General view of distal humeral epiphyseal seperation of right side of premeture patient. Anterior-posterior Radiograhy of distal humeral epiphyseal seperation of right side of premeture patient. Figure 2: Anterior-posterior Radiograhy of distal humeral epiphyseal seperation of right side of premeture patient. Ultrasonographic evaulation of distal humeral epiphyseal seperation of right side of premeture patient. 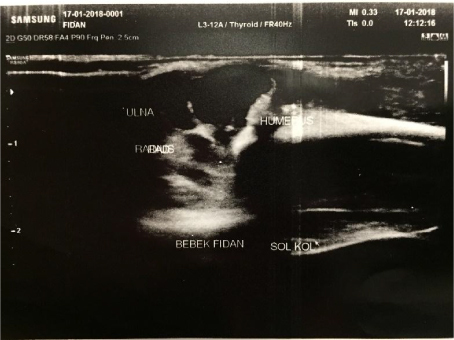 Figure 3: Ultrasonographic evaulation of distal humeral epiphyseal seperation of right side of premeture patient. Fracture–separation of the distal humeral epiphysis in the newborn is a rare injury, typically seen following a difficult birth or child abuse [2-4]. In neonates, it is known as Salter-Harris type I injury [5-6] and is classified as group A, according to DeLee et al. The clinical findings are swelling and tenderness of the elbow, with pseudoparalysis of the arm and “muffled crepitus” on movement, representing cartilage moving against cartilage . The three-point relationship between the olecranon process, the medial humeral epicondyle, and the lateral humeral epicondyle may not be ascertained due to elbow swelling. Therefore, the clinical findings and physical examination do not always allow a definitive diagnosis, and the injury can be overlooked in the newborn [9-11]. Fracture-separation of the distal humeral epiphysis in neonates is difficult to diagnose radiologically because the cartilaginous epiphysis is radiolucent. In our case in which fracture-separation of the distal humeral epiphysis was diagnosed with the help of ultrasonography, which provided a clear determination of the injury . In the newborn, the interface of the epiphysis of the distal end of the humerus with the metaphysis is smooth and transverse. Moreover, at birth the supracondylar region with coronoid fossa and olecranon fossa is partially within the metaphysis and partially in the epiphysis, leaving a weak point in the physis. Only during the first 6 months, with skeletal growth, the supracondylar region migrates completely into the metaphyseal region. Furthermore, in the newborn the resilience of the distal humerus could be lower as trabecular bone around the supracondylar fossa is still not oriented in the two columns, and the metaphyseal cortex is characterized by fenestrated bone . Because of these particular features during the development of the distal humerus, rotatory or shear-type fractures totally within the physis are taught to be the most common fracture pattern in the newborn during delivery as in our case of newborn. Typical clinical findings are swelling, tenderness and pseudoparalysis of the arm. A crepitus probably due to the reciprocal movement of the cartilaginous fragments has also been described. The findings are not specific, and the physical examination alone usually does not allow a diagnosis. A brachial plexus palsy must be considered due to pseudoparalysis, but an accurate examination normally allows distinguishing between these conditions by observation of spontaneous movement of hand, wrist and shoulder. For the diagnosis of this condition radiography alone is rarely adequate and ultrasonography (USG) or magnetic resonance (MR) may be needed in establishing the diagnosis clearly. USG is a non-invasive technique to differentiate elbow dislocation from distal humeral epiphysiolysis and also effective to identify the diagnosis by itself. MR are more invasive and may nessessitate general anestesic for immobilization for markeble scan plan . Direct arthrography offers the ability to highlight unossified cartilaginous structures about the elbow joint. Direct arthrography has been described to help diagnose elbow injuries in infants when the diagnosis is not clear from plain radiographs . However, need for anestesia and surgical intervention the use of direct arthrography seems not for initial treatment option. The treatment of transepiphyseal elbow separation consists of aligning the epiphysis with the metaphysis . Usually, this can be obtained by closed manipulation or traction or percutaneous pin fixation. Open reduction has rarely been documanted in the litarature. Cubitus varus is the most commonly observed long-term complication of this lesion. However, Cubitus valgus and limititions of range of motition of extanesion end flexion have been described [16- 17]. When necessary, the treatment of these complications is usually planned years after the initial lesion, during the childhood, normally with corrective osteotomies. Distal humeral epiphyseal separation is a rare entity in newborns, and mostly associated via normal vaginal predelayed deliveries. In most cases the differential diagnosis and treatment options can be confusing. Ultrasonography can be referred as first diagnostic option due to it is noninvasive method. Closed reduction and plaster cast splint or open reduction and percutaneous pinning is suggestable as treatment effectivity. Mr. Solgun was the project leader and performed literature search, designed the study, and coordinated the data analysis, data interpretation, writing, editing, and submitting of the manuscript. Mrs. Yurdaışık was the executive researcher of the study. He performed literature search, data collection, data analysis, data interpretation, writing, and submitting of the manuscript.